Gun violence poses a concerningly severe problem in Chicago as the homicide rate is at it’s “highest numbers in two decades” (Sanburn, 2017, para. 5). As seen in this CBS Evening News clip from May 6, 2018 more than 50 people were shot in Chicago during the week of April 29-May 6. Such unspeakable violence taking place in the neighborhoods of Chicago has brought the attention of political leaders in the United States and been recognized as problem worth giving attention to. While President Trump’s tweets must be taken with a grain of salt, the fact that Chicago’s violence came to his attention is worth recognizing. Further, issues have arisen with the residents in Chicago’s most dangerous neighborhoods as to why they aren’t receiving more attention from law enforcement. 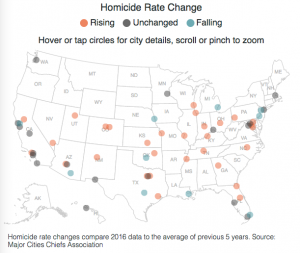 Reported in a TIME article titled “Violent Crime Is On the Rise in U.S. Cities,” researchers found that “violent crime increased in many of the nation’s largest cities [from 2015 to] 2016” (Sanburn & Johnson, 2017, para. 1). For example, “Arlington, TX had 4 homicides in 2015 but 18 in 2016” (Sanburn & Johnson, 2017, para. 2). 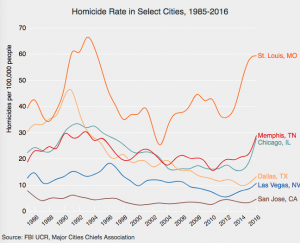 While violent crime in most U.S. cities is on the rise year to year, it is still not anywhere near the levels of violent crime during the early 1990s. 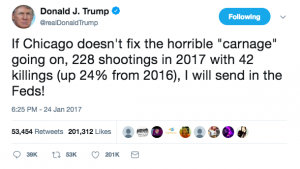 This is why we must take President Trump’s tweets with a grain of salt, as he frequently portrays the crime rates in certain cities as worse than ever before, which is untrue. However, the fact that violent crime is rising is still a concern. The problems which create violence are similar throughout cities: “gang violence and retaliation, violence associated with drugs, [and] the overwhelming numbers of guns in many U.S. cities” (Sanburn & Johnson, 2017, para. 6). Being exposed to such immense amounts of violent crime has anything but a positive effect on students and their scholastic achievement. Trauma shapes learning. In poorer, urban communities violent crime runs rampant; “school failure isn’t concentrated in poor communities randomly” (Ross, 2014, para. 13). Many kids in such schools are “in survival mode” (Ross, 2014, para. 13) and are only thinking about how to get home safely, get food on the table, etc. When prevalent exposure to violence forces students to have more on their plate than just school, academic performance drops. “High stakes testing and heavy reliance on test scores for college admissions puts kids who experience community or school violence at a distinct disadvantage” (Burdick-Will, as cited in Ross, 2014). In short, when students have to survive neighborhood violence day to day they suffer academically, and “in becoming resilient people, [students’] academic and social preparation for college [takes a hit]” (Ross, 2014, para. 23).